In this editor's humble opinion, the GTS models are always the best versions of any Porsche. They're the cars the way enthusiasts would option them, sold at a reasonable cost. As part of the massive Porsche leak today we know the 2014 Boxster GTS and 2014 Cayman GTS will continue this tradition. 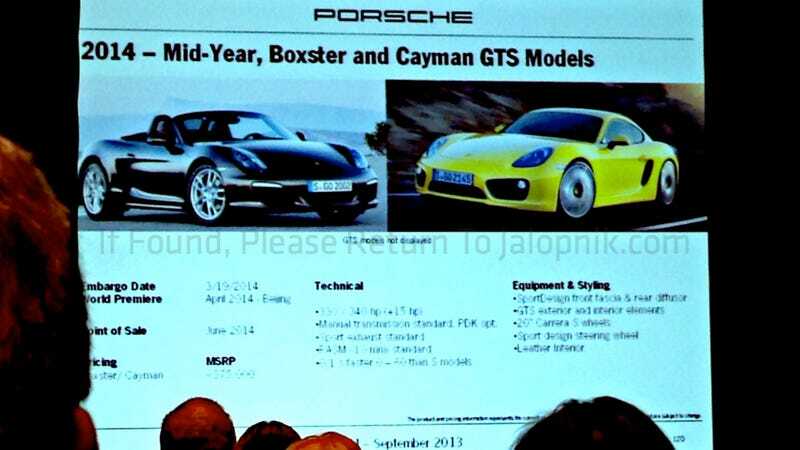 This slide, allegedly from a dealer meeting, purports to show what's going on with the lovable Boxster and Cayman models, which should get a nice, slight tweak over the existing S models. This should premiere at the Beijing Motor Show this April, if the slide is to be believed.